Mr. David Forest Richards, Jr.
Adams announces the passing of Mr. David Forest Richards, Jr., 89, who transitioned on Tuesday, February 5, 2019 at his residence surrounded by his loving family. Adams announces funeral services of Mr. David Forest Richards, Jr. which will be held 11:00 A.M., Saturday, February 16, 2019 at St. Philip A.M.E. Church located 613 MLK Jr. Blvd. Visitation with the family will be held from 6:00 P.M. – 9:00 P.M., Friday at the church. Interment: Hillcrest Abbey East Cemetery. Chief Warrant Officer 4 David F. Richards, Jr. is a native of Sedalia, Missouri born to the late David F. Richards, Sr. and Julia Christina Diggs Richards. He is a World War II and Vietnam Veteran retired from the United States Army, with thirty years of distinguished service; with numerous awards and decorations including a Silver Star, Bronze Star and Purple Heart medals for heroic valor. 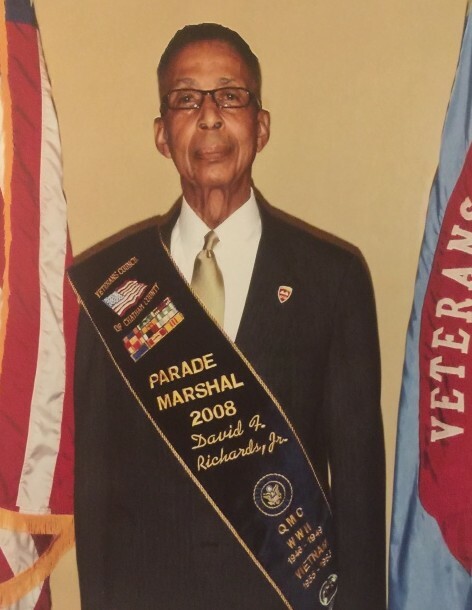 Richards’s most outstanding award was his induction as the first African-American in the Parachute Rigger Warrant Officer’s Hall of Fame in 1993 in Fort Lee, Virginia, Distinguished Order of Saint Martin, Quartermaster Corps, U. S. Army with over 11,000 parachute operations world-wide without incident. He received honors from the legendary 555thParachute Infantry Associations, Inc. “Triple Nickels” and the Dodge Award in Fort Lee, Virginia. In November 2018, Richards was one of 17 veterans inducted into the Georgia Military Veterans Hall of Fame for his contribution to airborne military operations which will be displayed at the Georgia State Capitol Complex. After retiring from 30 years of service with the U.S. Army, Richards was employed with the City of Savannah Police Department as a Crime Prevention Analyst for twelve years. David F. Richards, Jr. was an active member of the Savannah community serving in numerous capacities including Charter member of 100 Black Men of America, Inc., Savannah Chapter, Vice-Chair of Gateway Behavioral Health Services, Board of Director of Ralph Mark Gilbert Civil Rights Museum, Member of City of Savannah Tourism Advisory Committee, Board of Director, Martin Luther King, Jr. Observance Day Committee for 25 years, 33rdDegree Mason, Allah Temple #6 and Fred W Dabney Lodge #24 MWPHGL of Missouri and 39 years as a brother of Omega Psi Phi Fraternity, Inc. Richards was the Grand Marshall for the 2008 Veterans Day Parade and 2019 Martin Luther King, Jr. Parade. Richards is a graduate of Park College, Kansas City, Missouri, with a Bachelor of Arts degree in Business Administration, and a Master of Arts in Human Resources Management from Pepperdine University, Los Angeles, California. He also graduated from St. Louis College of Mortuary Science as a Licensed Embalmer and Funeral Director for the State of Missouri. He was a Senior Adjunct Professor at St. Leo University of Florida – Savannah Center, teaching business and human resources management/administration courses at the United States Army Education Center, Hunter Army Airfield, in Savannah, Georgia. Previously, he has taught at Savannah State University, Central Texas College and Embry-Riddle Aeronautical University. Richards was an active member of St. Philip A.M.E. Church in Savannah, Georgia. He served as Pro-Tem of the Trustee Board; 6th District African Methodist Episcopal Church Strategic Planning Initiative Representative and sang with the melodious baritone voice in the Saint Philip’s Mass Choir, Foundation Choir and Men’s Choir. He was married to the (late) Swannie M. Richards for fifty-nine years. They have three children; Rev. David F. Richards, III (Linda), Yvette Kim Richards and Dr. Bonnye R. Anthony (Vincent, Sr.), nine grandchildren, five great grandchildren and one great great grandchild. Celebration of life arrangements are handled by Adams Funeral Home. Visitation is Friday, February 15th6:00 – 9:00 pm at Saint Philip A.M.E. Church 613 Dr. Martin Luther King, Jr. Blvd. Savannah and Homegoing Service is Saturday, February 16th11:00 am (also) at Saint Philip A.M.E. Church. In lieu of flowers, donations can be made towards the Mr. David F. Richards, Jr. Scholarship with Omega Psi Phi Fraternity, Inc. Mu Phi Chapter, PO Box 1363 Savannah, Ga. 31402 (Memo: David F. Richards, Jr. Scholarship).